I'm back with another query that worked. Two years ago, sixteen-year-old Alora was found wandering in the woods with no memory of her life. It's 2013 now and the blackouts have started again. Each time Alora wakes up in a different place with no idea of how she got there. The one thing she is certain of? Someone is following her. In 2146, seventeen-year-old Bridger is one of a small number of people born with the ability to travel to the past. While on a routine school time trip, he sees the last person he expected—his dead father. Who, according to the Department of Temporal Affairs, was never assigned to that time. He’s even more stunned when he learns that his by-the-book father was there to break the most important rule of time travel—to prevent the murder of someone. 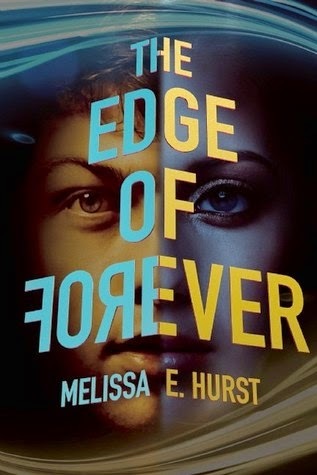 Told in a dual point of view, THE EDGE OF FOREVER is a 98,000 word YA science fiction novel. It is stand-alone with series potential and may appeal to readers of Marie Lu’s LEGEND or Myra McEntire’s HOURGLASS. Thank you for your consideration. This is a great example of a query that introduces a book with two narrators. It's also a great example of a query that builds. We find out some information about Alora--including the fact that someone is following her. That first paragraph introduces some heavy conflict. The next paragraph introduces even higher stakes in the conflict--impending murder. And oh yeah, it's Alora's murder. This is also a query that introduces good worldbuilding details in a subtle way, so that they don't get in the way of the story. It's concise and every word counts. After I signed Melissa, I sold the book to SkyPony and it comes out June 2nd!